I know patlini, your post was just above Rudy's question! Oh, you mean Reply #317? Ok, gotcha. Finally! ~~~~well the perezhilton page is loading...oh so sloooooooeeee. You mean this?!!! WOW! Do they really rock or whaaat!! I love 'em to pieces! I watched only the last 30 min of the Emmys...darn it. Now I wish I'd taped & watched the Emmys instead of Heroes. The most fashionable couple at the Emmys!! More looking absolutely Fab pics! We are excited to be joining you again for this upcoming Fall edition. Join us weekly as the Thrills, Chills, and (yikes!) Drama unfolds. We will be offering our unique insights as former racers and are looking forward to hearing YOUR thoughts as well. That's right: The "Pink and Black Attack" has arrived here at CTV.ca! We actually had someone on the spot and more pictures should be coming! The most fashionables joined me in a ride to see Mark & Bill's viewing party. All thanks go to Peach for the connections. I had to unload all the tools and junk I usually carry in the car to make room for Vyxsin's own full-sized toolbox of makeup apparatus . Just kidding (about my tools). We had a great ride and I learned a lot. Kynt and Vyxsin are blogging for CTV! Each week, we will grant one team our CUPCAKE AWARD for excellence, effort, and a game well-played! Our first honorable CUPCAKE goes to MARK and BILL!!! They showed intrinsic ingenuity from step #1 - the "showdown" at the first Airport. Mark and BIll not only lived up to, but exceeded, our already high expectations. Your GEEK POWER is strong ----- keep it GOING GUYS! The ending of this episode was bittersweet, however, as one of our other favorite teams ---- the "HIPPIE HIVEMASTERS" as we liked to call them ----- Anita and Arthur ----- lost their "buzz" in more ways than one, as they checked into the pitstop in LAST PLACE and were promptly "STUNG" with the news of their elimination. During the pre-season publicity for the Amazing Race, Anita and Arthur were clearly one of the most aniticipated, and "talked about" teams, coming up regularly in conversations on internet forums, as well as TV talk shows. They played this First Leg of Amazing Race with confidence, courage, and class. They may not have made it far, in terms of Legs, but their time in the Race was both IMPACTFUL and INSPIRING. Despite the age differential between them and the other contestants, Anita and Arthur arrived to the pitstop only MINUTES after 10th place team Marisa and Brooke [the "DIVORCED DAMSELS"]. Anita and Arthur will be remembered for providing Episode 1 with it's most memorable line. Amidst the hectic confusion in Brazil, Anita exclaimed, "BEES ARE MUCH CALMER THAN ALL OF THIS!!!" If you read through the Vyxsin and Kynt blog about AR13ep.1 to the end, it says "They will have a crucial time advantage over the other 9 teams, should they use it effectively." I do not understand it, because it looked like Ken and Tina finished about 5 minutes behind Nick and Starr. I also thought that Terence and Sarah and Mark and Bill were not far behind. The finish time of Nick and Starr per their Insider clip was "1 hour 10 means after they started" on April 24, which means it is 1010 with them being in the 9:00am release group. Add 12 hours and you have 2210 for pitstop release. It will take 5 minutes to get back from Forte Sao Marcelo and an unknown amount of time to flag down a taxi. Then it is a straight shot 12 miles up the coast road BA099 to Magelhaes International Airport. At that time of night traffic should be light. I am guessing that they could be there betwen 2245 and 2300. If on the earlier side of that range then they could get on GOL 1604 SSA FOR 2310 0055. If not, they will get bunched with all other teams going on GOL 3366 0230 0415. However, if successful they will have a 3 hour 20 minute lead. It may not be possible for any other team to do the same, but Ken and Tina, Terence and Sarah and Mark and Bill could theoretically do it. Any teams that wants to try is going to have to really hustle(not a problem for the first 3 of these teams and we'll see about Mark and Bill). If a team even stops to check on flight times, they are not going to make it(but would not know that because they should not have access to any schedules at the pitstop since they don't know where they are going. The latest Kynt and Vyxsin fancast blog! The pink and black team are attending different TAR viewing parties near LA and then reporting their take on the latest episode. EVERYTHING YOU NEED TO KNOW FOR THE AMAZING RACE, YOU LEARN IN FIRST GRADE! The latest Kynt/Vyxsin fancast recap of TAR 13!! We would rank the teams' attempts at the wrestling match as one of the most entertaining moments in Amazing Race history. This task was very difficult, as it tested a team's physical strength to perform the moves, but also their mental capacity to perform them in the right order, per the choreography. The absurd visual of team members in full wrestling tights and regalia was just unforgettable. -Out of all the Racers who tackled the Rasslin' Roadblock, Ken was by far the BEST wrestler when it came to skill. DALLAS, however, looked the HOTTEST in wrestling tights. Hands down. Everyone is wondering.....how on EARTH did the Race's most CEREBRAL team make such a mental oversight? How did they MISREAD the instructions? Mark and Bill had PROVEN in the previous legs that their BRAIN POWER could counteract the BRAWN of the other teams. After much deliberation......only one explanation can be offered. The DARK SIDE of the Force descended in Bolivia. And Mark & Bill were it's victims. Get the whole story HERE! A special edition to bring you news of Phil's DAD! Lots of pics of K/V and Aja/Ty and Stephanie/Anthony watching the last race together! Kynt and Vyxsin's latest recap of TAR 13! People just kept arriving in every direction and the amazing array of attendees was just heartwarming! When Racers MARK and ANTHONY & STEPHANIE arrived, the room jumped for joy! 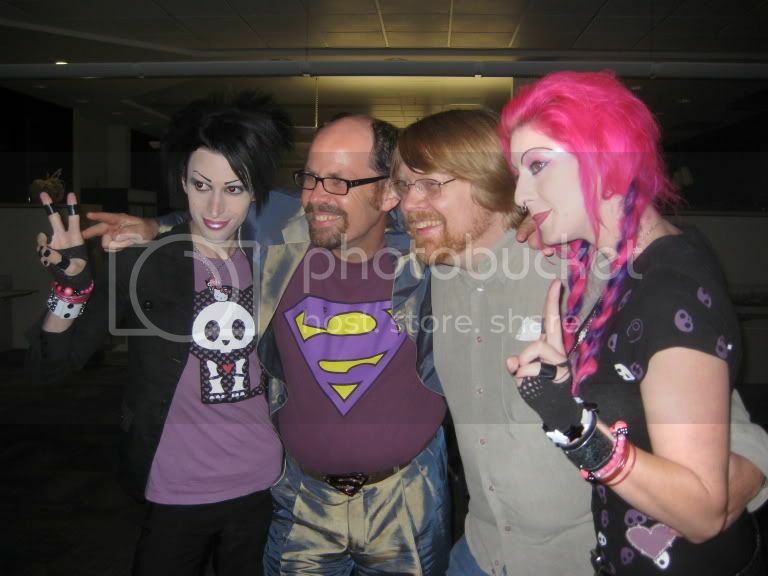 The partygoers had no idea that Amazing Race teams would be showing up, as we had kept it a secret! Read the whole story here --you may even find a BB surprise! Latest fancast report from K&V! Tonight's episode clearly illustrated the UNPREDICTABILITY of this game. The team order is truly subject to change at the moment you LEAST expect it. And no matter how great a team is......let's face the facts....a BAD CAB DRIVER can tank you. 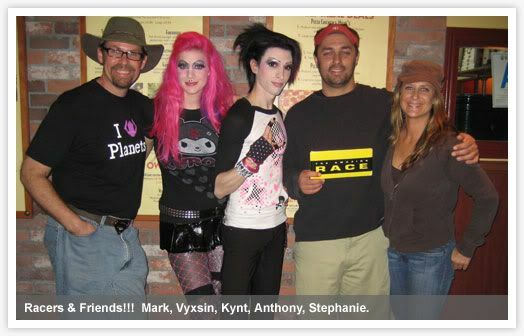 Wow, come join Kynt & Vyxin are in SF next Sunday to view the Amazing Race!! Sounds like a blast!! not many on this board out west though other than me and maybe mswood? ALL AGES" AMAZING RACE FAN PARTY in SAN FRANCISCO!!! If you live in SAN FRANCISCO, CALIFORNIA or a surrounding area, come out and watch THE AMAZING RACE with us on SUNDAY NOVEMBER 16th!!!! Get ready for a GREAT party!! Our good friend SAMANTHA ZURCHER is throwing an "AMAZING RACE FAN PARTY" on Sunday night, November 16th, beginning at 7pm, at JONES RESTAURANT & LOUNGE in San Francisco! Kynt and Vyxsin WILL be there!!!!! And YOU are invited to come party WITH us!!!! 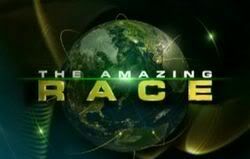 The party BEGINS at 7pm and we will be WATCHING THE AMAZING RACE together on the BIG SCREEN TV's beginning at 8pm! San Francisco, CA 94123 --- use MAPQUEST if you need directions! ---Party begins at 7pm, we will watch the Amazing Race together at 8pm! ***Jones is a GREAT family-atmosphere with plenty of TV's to enjoy the program! ***We are expecting a GREAT turn-out for this party so be sure to get there EARLY! If you live in San Francisco, CA or a surrounding area, please come out and play! If you are able to attend, please RSVP so we can hopefully meet at the event! Wonderful NEW CBS Interview-- from San Fran!! If you are there--don't forget the Sunday night VIEWING PARTY! !